I seriously love these things. And I think the very best part of all is they only cost a few bucks each since I already had the spindles laying around the house. 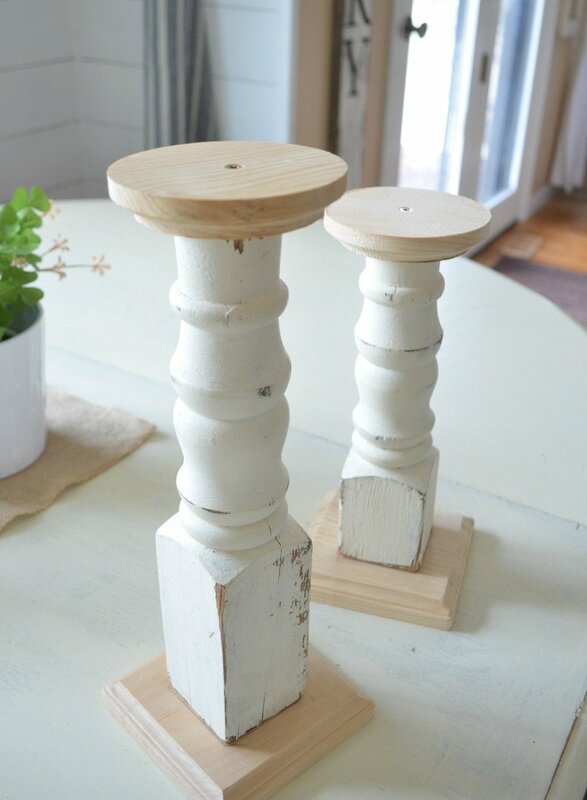 But even if you don’t have spindles on hand you can easily find them on Craigslist. I did a quick search in our area and several options popped up for super cheap. OK, let me show you how simple these were to put together. Here are my spindles before. I had previously cut these down so I could use them in vignettes or other random spots, so the sizing on these actually worked pretty well. 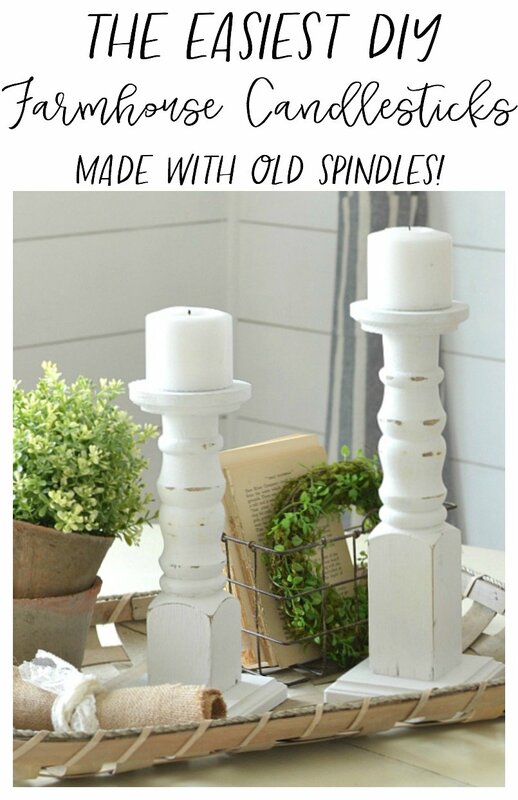 If you have full size spindles just go ahead and cut them down to whatever height you’d like the candlesticks to be. Next up was attaching the base. 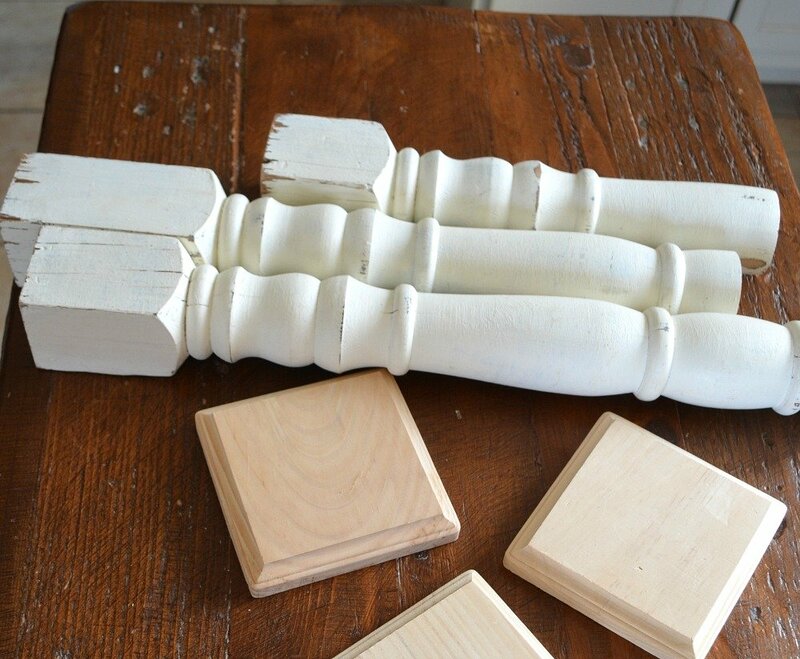 You can find a ton of wooden pieces like this at just about any craft store. Just browse around until you find some you like. 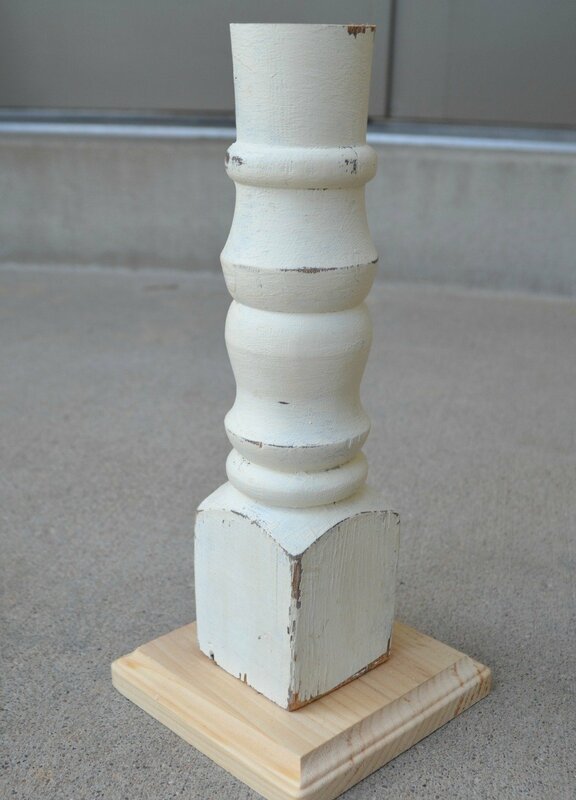 I simply screwed this wooden base to the bottom of the spindle. EASY. Now you’ll do the same thing on the top. I went with circular tops for my candlesticks, I thought they matched the spindle the best, but you can do whatever your heart desires. One quick thing to note–I actually flipped the round piece upside down, then attached it to the spindle. 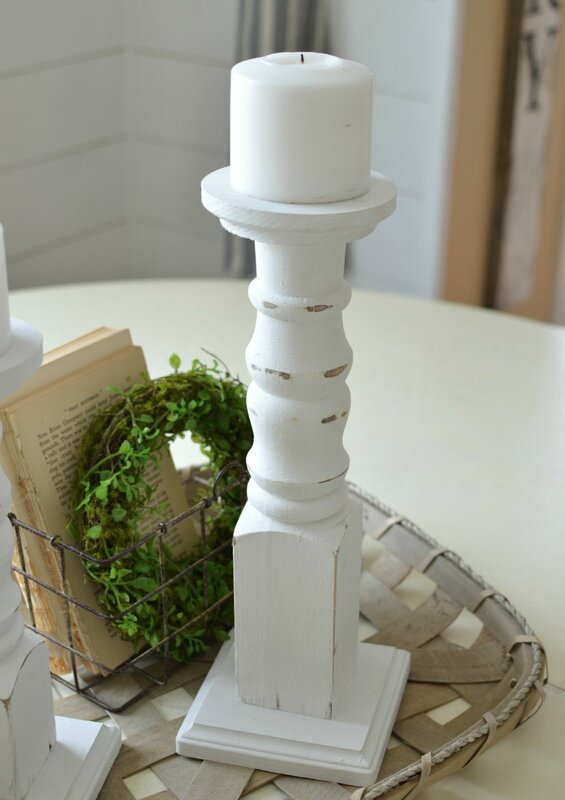 I wanted it to taper up like most candlesticks do and I thought it looked better this way. See how the smaller part is facing down towards the candlestick? I think that really helped make it look more balanced. Screw it in place and voila! Final step: PAINT. 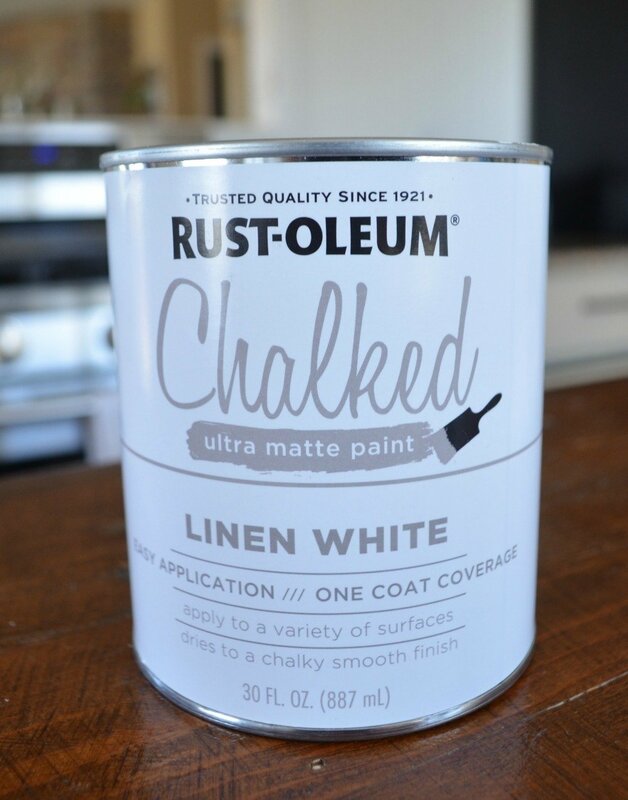 I used this Rust-Oleum chalk paint in Linen White and I was really impressed. This was my first time using it (I’ve tried the spray paint version, see my post about it here) but I was really happy with this paint. 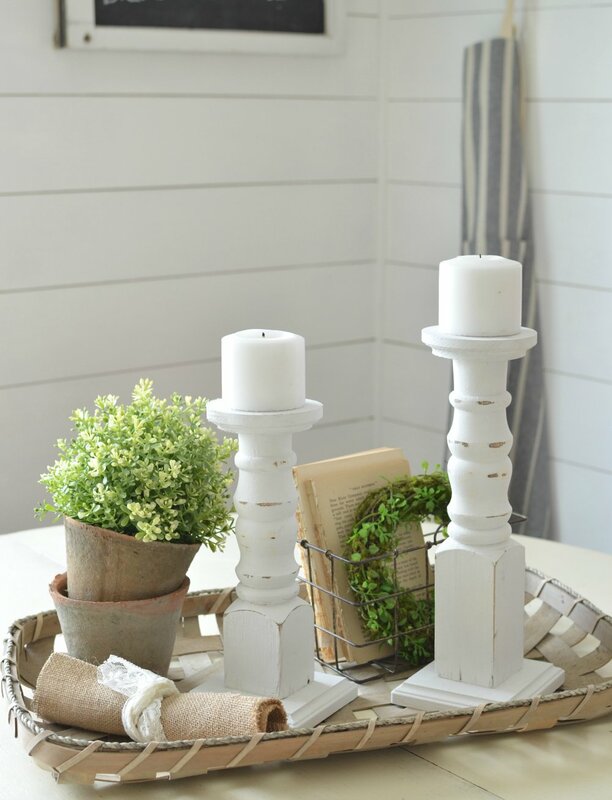 It covers well, dries fast, and has the same look as the Annie Sloan Chalk Paint–only it’s much, much cheaper. I haven’t used this on any big pieces yet, but I’m excited to keep trying it out. So far it seems awesome and you can’t beat the price. I only needed one coat and the candlesticks were done! Boom! So simple, right? After painting them I went ahead and sanded down the edges in a few random spots just to give them more of a farmhouse vibe. I just can’t help it, I must distress all the things. 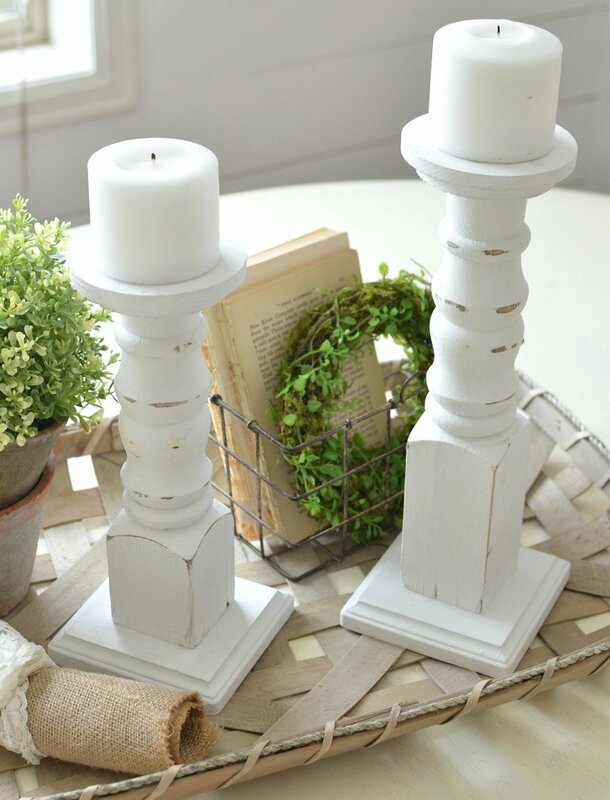 I must say, I’m pretty smitten with these little farmhouse candlesticks. I honestly wish I had about 10 more of these so I could have a few in every room of the house. And as far as DIY’s go, you really can’t get much easier than this project. 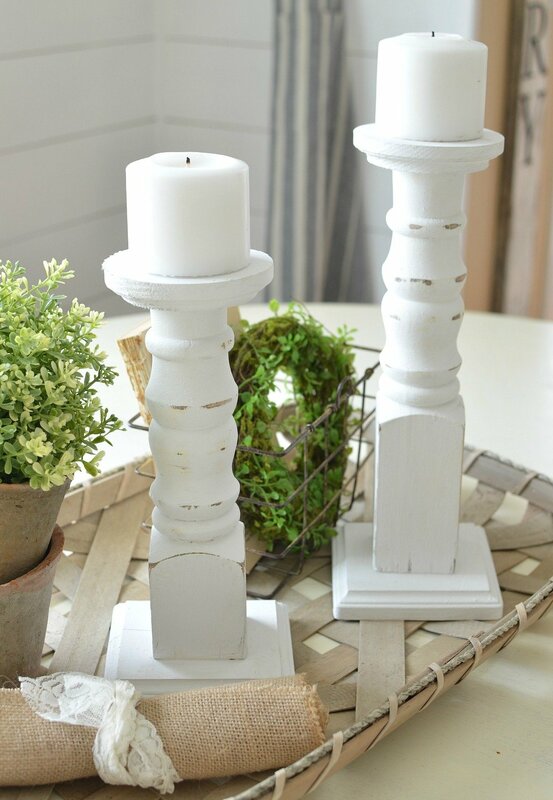 Just a few screws and a bit of painting, that’s all it took to turn these spindles into farmhouse candlesticks. Plus they’re functional and cute as heck, which is a pretty nice combo. Well that was short and sweet, but I’d love to hear what you think of this little project! And I just want to thank you guys for all the support and kindness you give me on a daily basis. I know I always say this, but I really do appreciate you being here and taking time out of your day to drop by for a visit. It means so much! 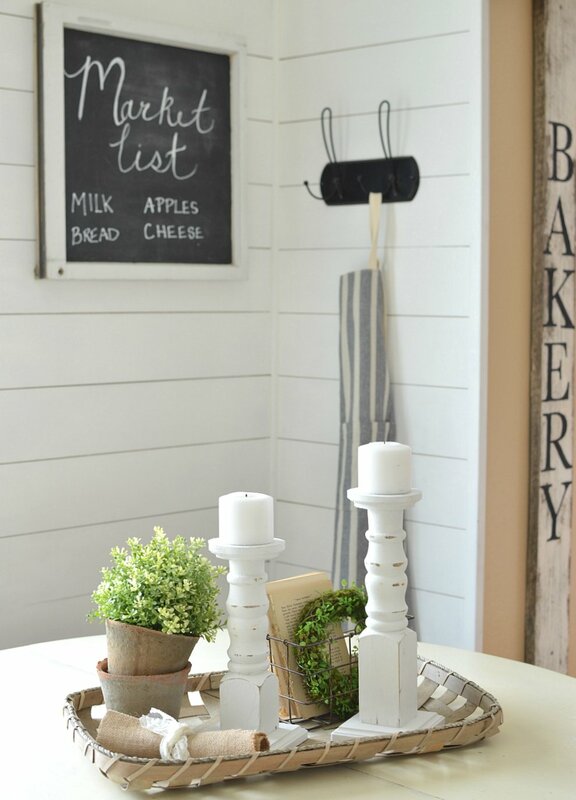 Now that’s a DIY in my budget and what a timeless touch for any room. Thanks for sharing! High five to distressing all the things Darlene! You’re my kind of gal. Your posts always seem to come at the perfect time! I was just about to buy a set just like this but now I will definitely make my own! Thanks so much! Oh yay! I’m so glad this came at the perfect time for you Hollie. Definitely give it a try making your own! Thanks Helen, definitely give it a go! love this idea. Will have to try them. Girl, I have a thing for spindles too. My hubs says it’s more of an obsession but oh well! Love those little cuties you made. So cute, I just made a couple of these myself, they look very similar to yours!! That’s awesome Lynn. Aren’t they easy? I can’t wait to make more! Great idea! That paint is my go-to as well. I also haven’t used it on any large pieces, but have had a good experience using it. Love the distressing too! That’s good to know Stephanie. I’m excited to try this paint out again. 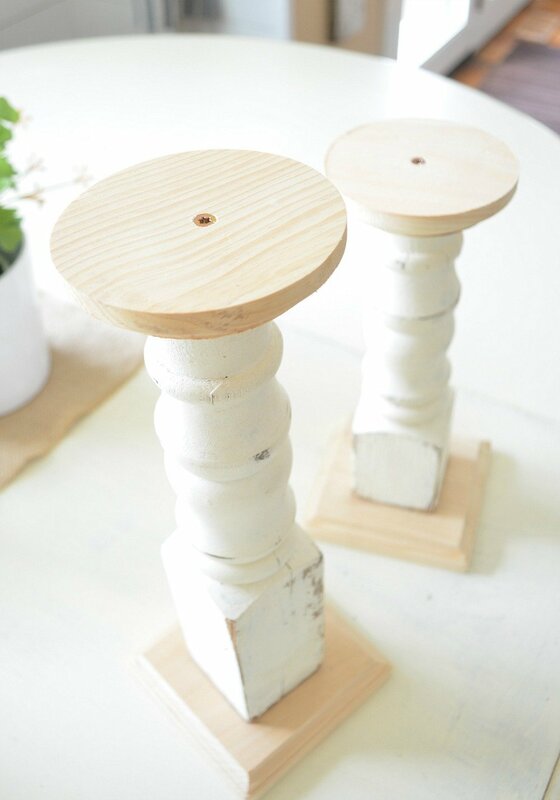 AS chalk paint is just darn expensive. I think this will be a great alternative! Oh good tip, thanks for sharing Sarah Jane, I will remember that. ps: I love your name! What a super, great idea. I love it and can’t wait to try it. Thanks, Sarah, again, for this wonderful idea. It’s so darn easy Doreen, I need to make several more because I’m already moving these around like crazy! Girl, you are the bomb! Go have a donut!???? What is the word I am looking for, LOVE, that’s it I LOVE THEM!!!!! You can get a new spindle at Lowe’s for around $12 and cut it down into 3 different sizes. Use flower pot dishes, the kind you put under a clay pot look cute because they have a rim around the top. 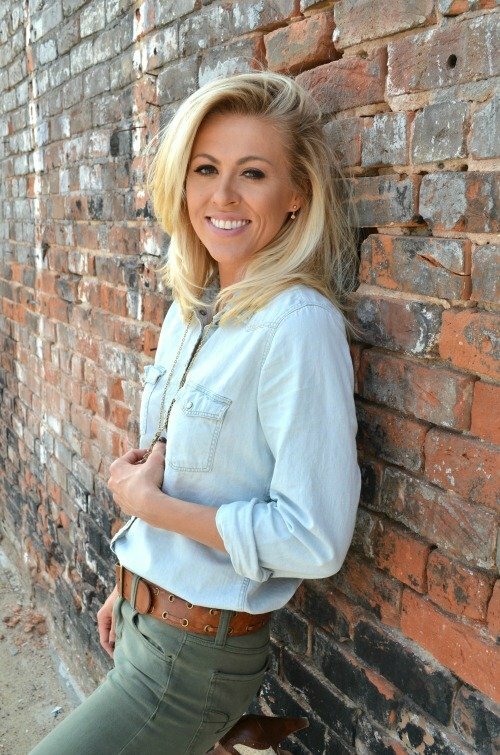 Good Morning Sara, My name is Pamela Garrett and I am wanting to paint a few pieces around my house, you have a dresser you done in a yellow color could you tell me everything about the paint would like to use what you did only in white, I love the finished look of the piece. Thank you so much. I love your work and your home is beautiful. I’m getting ready to paint a couple of old brass lamps and I was wondering if you sealed it anyway? Wax? Poly? These are pretty darn cute! Nope, I didn’t seal them. But you could use wax if you wanted to seal them. I LOVE this! Thank you so much for sharing your DIY. love them, sarah! i may give it a try as a birthday gift to my sister! Oh good idea!! Let me know how it goes.